The newest cast member to join Elmo and the rest of the Sesame Street gang is Julia. 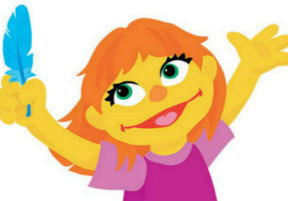 Julia plays an essential role in Sesame Street and Autism: See All in Amazing Children, an initiative launched last week to promote autism awareness. In the program, Elmo plays with Julia and helps other characters understand that Julia plays differently than them. Through his patience and understanding, Elmo helps his other friends become more aware of, and sensitive to, kids with autism. The project, available as an app and online, includes video with real kids on the spectrum, too. Sesame Street and Autism includes resources for family and friends including songs, stories and learning. There are guides for parents and other loving adults. Savvy Auntie recommends What to Say to a Parent of a Child with Autism and Taking Care of the Caretaker.